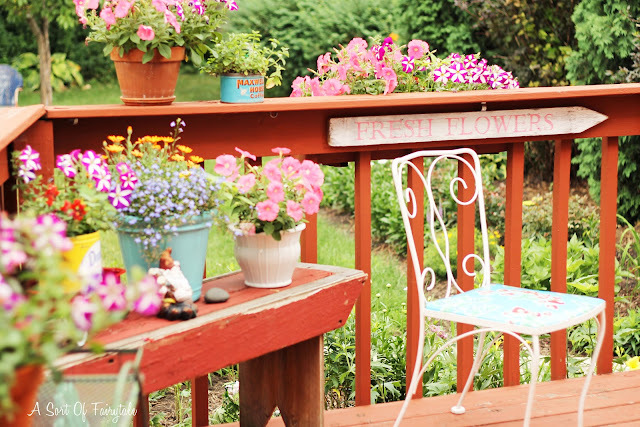 Things are bloomin' on the deck! I have had this white, vintage iron chair and it's mate for years. I recovered the seats in blue strawberry print oilcloth and they're one of my prized vintage possessions! 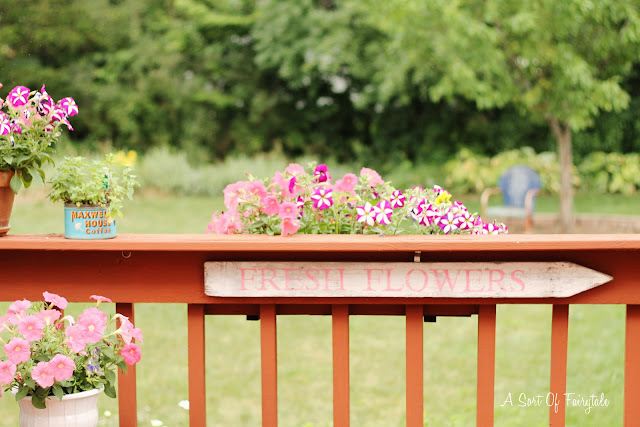 Urban Farmgirl made the "Fresh Flowers" sign and I just love it! I love to plant flowers and herbs in vintage tins...here i have flowers in a Domino Sugar tin and mint in a Maxwell House Coffee tin. I poke holes in the bottom for drainage. Let me discuss this orange-y deck for a moment...me no likey. Well, I like the deck, although it is falling apart kinda, but I do not like the color! The plan is to repair the deck, add an arbor, and re stain it, OR take it out completely and have a large stone patio put in. None of this will be done until next year, because I spent all my monies already on plants and gardens this year! Here's the stone patio off the deck, it's what I like to call "cheap and cheerful". The furniture is very "make do", with the exception of the yellow glider which I love. I don't think I will be buying any outdoor furniture this year, because, oh yeah, I spent all our money on plants. Unless, I find a vintage white or colorful iron set at a reasonable price (fat chance)! The "Shade Plants" sign is vintage from a nursery and was bought recently at The Northwind Perrenial Farm Antique and Garden Show. On another note, I wanted to thank so many of you who left kind and encouraging comments on my new business venture, Cottage Industry! I really, truly appreciate all of your well wishes!! 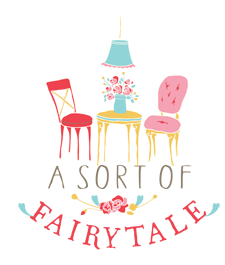 Don't forget (or if you missed it) there is still time to enter the Decorating Giveaway that was in the post about Cottage Industry. "Aren't daisies just the friendliest flower?" I posted yesterday on my blog that my blog friends are becoming an inspiration to me for gardening. 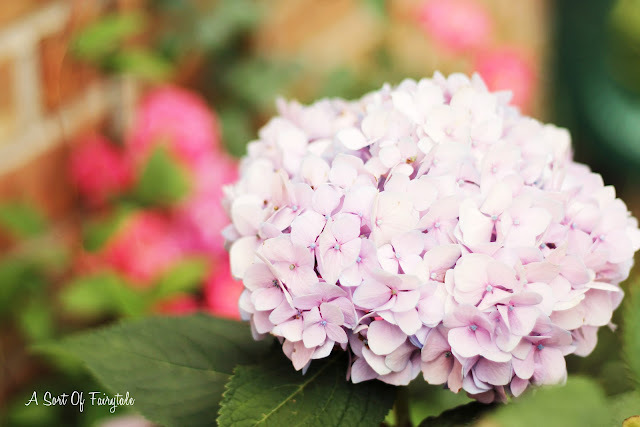 Your yard is so pretty and definitely inspiring! Flowers cover a multitude of sins when we don't like something. 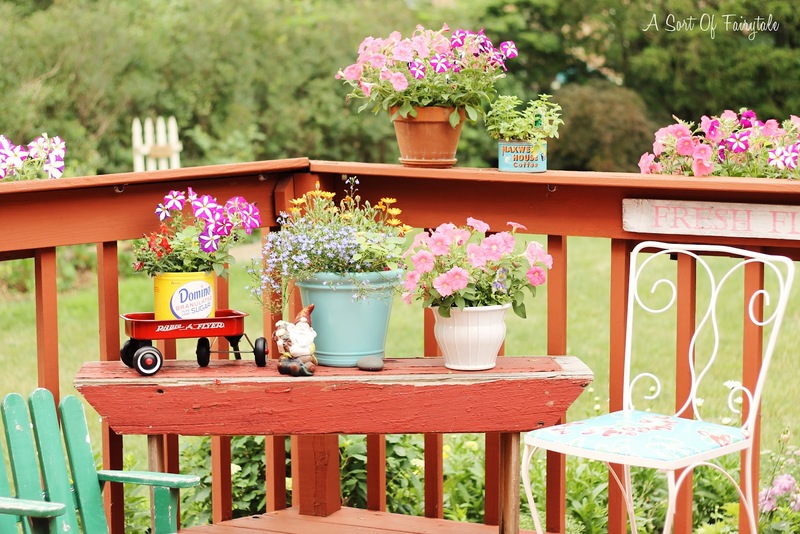 Your deck and patio look so pretty with all your planters. I am so excited for your new business. You will do great. 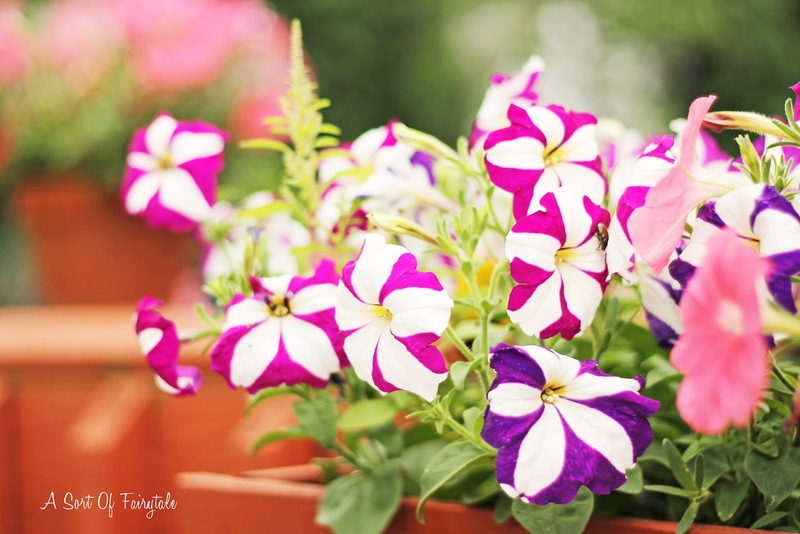 Your gardens a so pretty,I love all of your bright and cheery colors! 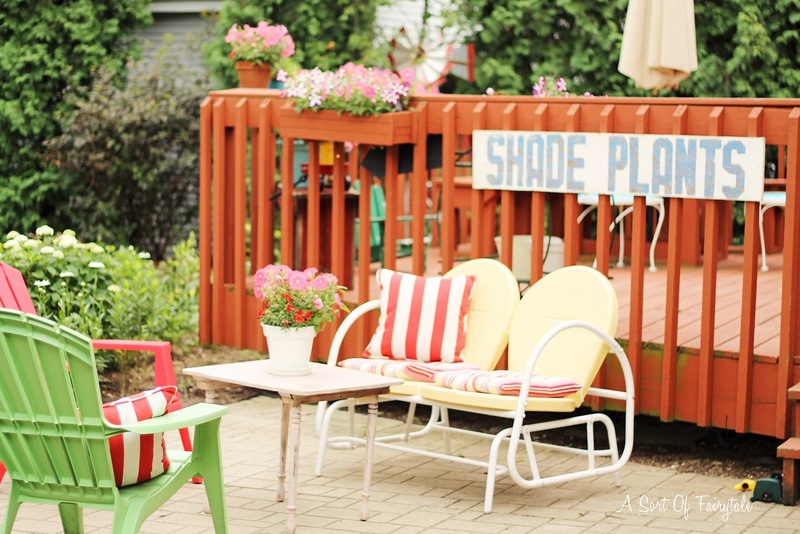 Everything in your garden is bright an cheerful just like your whole home. Love it! 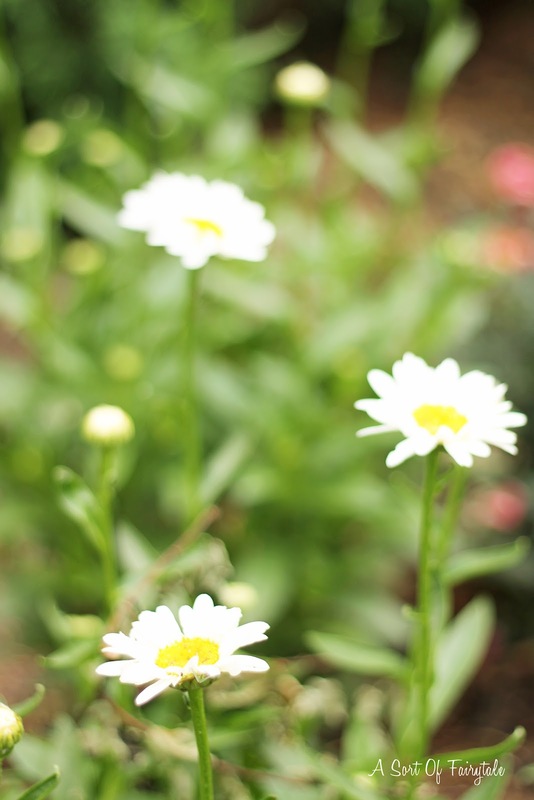 Yes, daisies are the friendliest flower! Love the quote and the movie! Your porch and flowers, etc. Look as charming as could be. This is what I would picture your flowers to look like! All happy and cheerful. 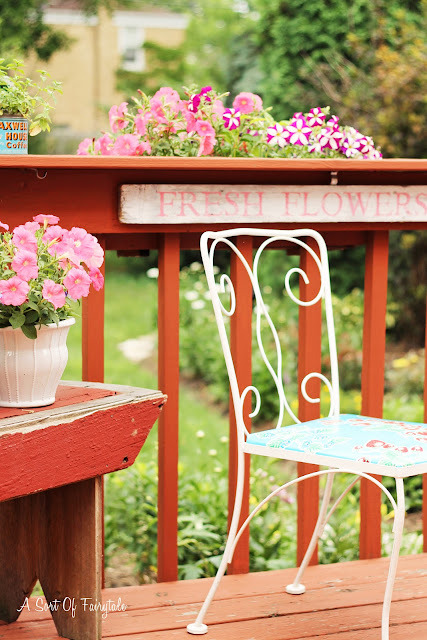 I really think the Fresh Cut Flowers sign adds a great dimension to your patio! What an awesome space! I love the signs - you've given me some great ideas !!!!! I have loved daisies since childhood. They are like sunshine. 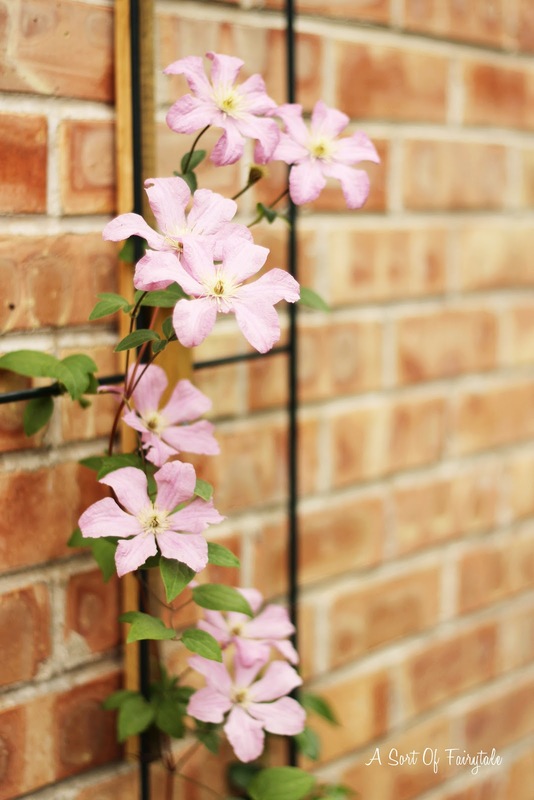 Your flowers are very pretty and lush, Stacey! Everything is so bright and cheery. I just adore your space:) Beautiful! your garden is blooming so beautifully, my friend. daisies are the friendliest flower! i'll keep my eyes open for some vintage wrought iron for you (i just saw the most magnificent set at an estate sale on the lake today, but it was marked sold). isn't that always the way? just watched that movie on cable! your deck is cuuuuuuuute as a button. Everything is looking so pretty. Your money was well spent because your plants are thriving. I love your glider. I have a red glider that I love also. Different style but so cute. 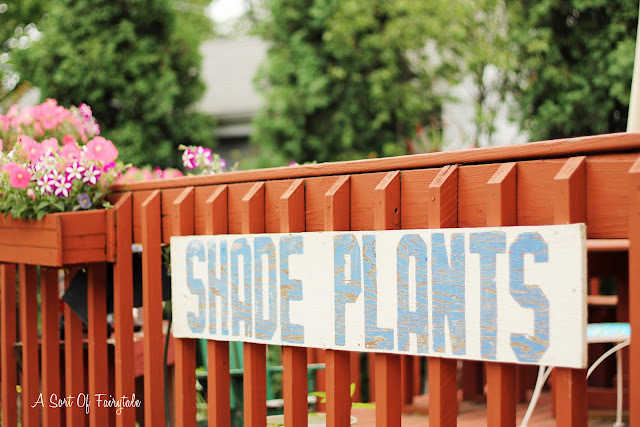 I love the Shade Plant sign. I have shade plants just below the right of my deck. I would love to make something similar to hang above them. Thanks for sharing. Your flower monies appear entirely well spent. Not only do they bring you joy, now they have brought all of us who read your blog joy too. Thanks for giving us the tour! Found your post at Funky Junk. Hope you'll stop over at Quirky Vistas! Congrats on your new biz Cottage Industry - you'll be a rockstar Stacey! Good use of all your money on those fabulous plants - I used the same stripey petunias this year! Your little wagon is adorable and that yellow glider needs to make it's way to my house! Just saw your lovely post on Hometalk, so I stopped by to say hi. Love your deck! It is adorable! :) Miriam. OMG Stacey! You have been a busy little bee - I just love your garden!!! You have done soooo much - mine is looking quite drab and won't look anything like that for awhile! lol Anyway, you've got such a wonderful green thumb there, missy! LOVE it - esp all the vintage tins! :) I've had some put aside for my garden, but it's been a work in progress, considering school has taken up much of my precious time! :( Anyway, wishing you a lovely day! I can totally relate to spending all my money on plants. We have been doing some clearing in my backyard (that looked like a jungle the other day) and now I'm realizing how much more I need to plant. I probably will wait till fall to do any major planting again. 1) cause of the cost and 2) the heat is just miserable here for new plants. I have had luck with drought resistant perennials but they still have to be watered and only have sprinklers and a long drip hose in part of my yard. Your deck and patio are so cute. Right now one of my living room walls is the color of your deck. It was the "in" color in 2007. I need to tone it down so I can do a softer cottage look in there. I could just stare at these inspirational pictures all day. Seriously :) You always, always, always make me smile! Hi Stacey! Just wanted to let you know I linked to this post on my latest post. 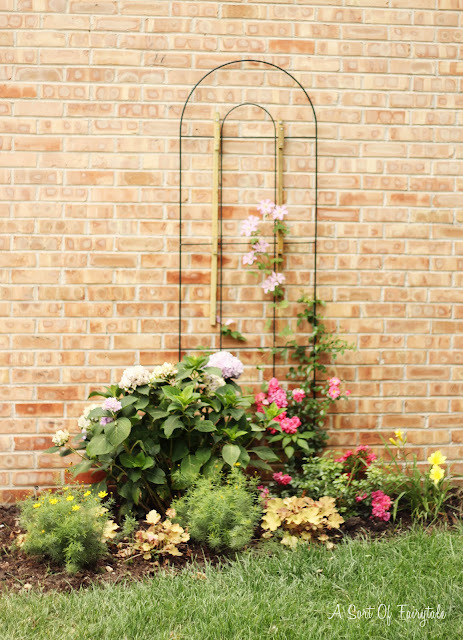 Love your cottage garden - it's really coming along quickly! Hope you got rain today! so cute. I always smile as I see things about your new home that you are so obviously enjoying. Your space is so you, and I know you will enjoy it and make it even more adorable over the years. Love your sweet space! Love it! And my entire house is a "make do" space. I didn't realize it until I read this post, but that's exactly what it is. It's so much more welcoming and homey than if I had had the money to by new though, so I'll take it!